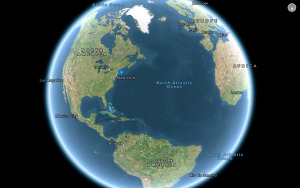 With iPhones running iOS 6, some users are unable to change their default ringtone selection. To see if you have this bug, start by going to Settings -> Sounds -> Ringtone. From the list that appears, tap the name of the ringtone you want to be the default. A checkmark now appears after the selected tone. The next time you receive a phone call, your selected ringtone should play. If it does, all is good. If you instead hear the Marimba ringtone, you have the bug. Marimba is the iPhone’s “built-in” default ringtone, indicated by the word “Default” in parentheses after its name. 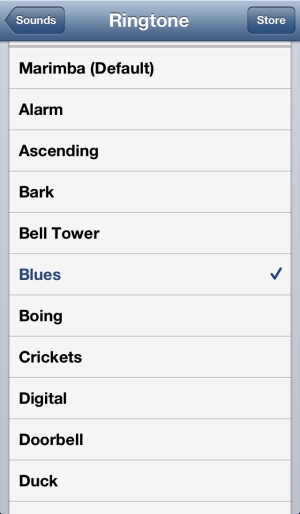 If you have the default ringtone bug, any changes you make to the default selection do not stick. Even though a checkmark may appear next to some other tone, Marimba is still the one that plays. One exception: If you set a custom ringtone for a particular person in your Contacts list, as done by editing the entry in Contacts, the chosen tone should play as expected—whether you have the bug or not. It’s only if the selection remains “Default” that you always get the Marimba tone. (1) Force close all apps listed in the iPhone’s multitasking bar (a basic technique explained in an Apple Support article). (2) Power down and restart the iPhone. Another thread suggests that a “reset” of the iPhone (accomplished by holding down the Home and Power buttons together until the device restarts) may be required for the second step. However, most users appear to have had success with the basic restart. Interestingly, this fix is exactly the same as the one an Apple Genius advised me to try for an excessively fast battery drain plaguing my iPhone 4S (as I covered in a previous column). While the fix worked, I have some trouble understanding why it works—for any problem. That is, why does one need to kill all the apps in the multitasking bar in addition to restarting? Shouldn’t an iOS restart by itself be sufficient? As covered in an Apple support article, apps in the multitasking bar “are not necessarily actively in use, open, or taking up system resources.” In other words, for most troubleshooting, it shouldn’t matter whether the apps are listed in the bar or not. Killing an app is primarily used for a problem with the app itself, such as if it appears “frozen.” However, the key word in the prior quote is “necessarily.” The article goes on to explain that “certain tasks or services can continue to run in the background.” Such processes include location services and audio playback. Even in these cases, restarting the iPhone should terminate the background activity. That’s why my assumption has been that actually force closing the apps prior to a restart should not be required. My assumption gets support from several web postings. For example, Frasier Speirs asserts that you should never need to kill apps in the multitasking bar as part of normal app management. Still, he concedes that you might need to do so if “one of the background-running apps goes berserk and will not terminate properly.” Perhaps something like this is what’s happening in the case of the bugs described here. Presumably, there is some difference between a restart where the multitasking bar repopulates with all the icons that were there before and a restart where the bar remains empty. Bottom line: If you are having any sort of persisting system-wide problem in iOS, try a simple restart of the device. If that works, you’re done. Otherwise, force close all of the apps in the multitasking bar and restart again. If that works, it doesn’t matter how many websites argue that it shouldn’t have made a difference. It worked for you. That’s what matters in the end. After installing Apple TV Software Update 5.1, some users found that their iTunes Match Music icon had vanished from the main menu. In most cases, the fix is simple. The basis for the fix derives from a new feature in 5.1, a feature not mentioned in the primary coverage of what’s new in the update. An Apple support article explains that you can now hide selected icons from the main menu display. To do so, go to Settings -> General -> Parental Controls and select to Show or Hide each listed item. An Apple Support Communities thread suggests that a bug in this feature may be behind the missing Music icon. 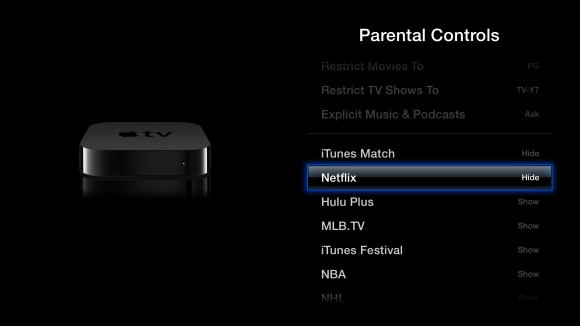 To get the icon to return, go to the Parental Controls and locate the iTunes Match item. It will probably be listed as “Show.” Even though “Show” is the desired setting, select “Hide.” Wait a moment and then select “Show” again. When you return to the main menu, the Music icon should now be visible. Oddly, in my testing, I had almost the opposite problem. The Music icon remains visible and active regardless of the setting I select for iTunes Match in Parental Controls. The settings work as expected for other items in the list.